Young Makers up and down the country are doing their exams this week, so our veteran designers are back to help you stay organised with this 3D printed ‘storage’ pet. This week’s Maker Project: 3D printed “storage” pet – helping to keep your tools and desk tidy. This week’s Maker Project is a modern twist on the classic project – the desk tidy. This week we’ve also been lucky enough to get our hands on the Ultimaker 2 provided to us by Create Educate. 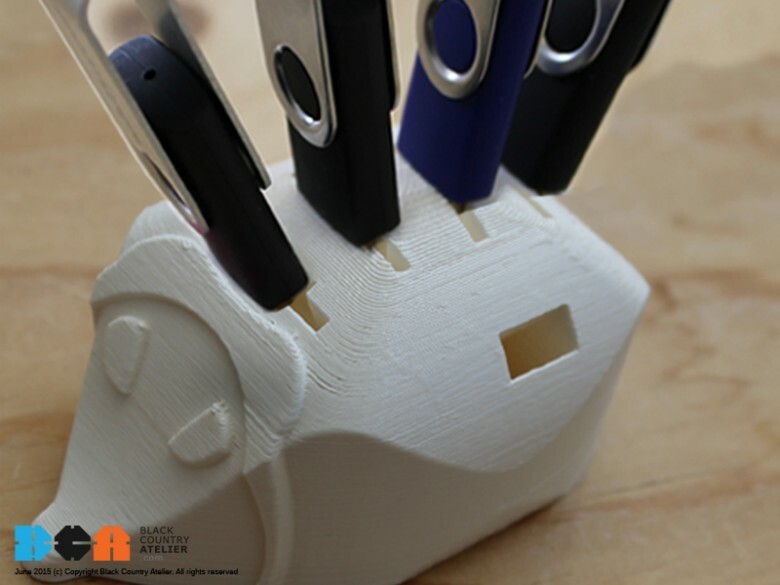 Our resident chief designer Mitesh gathered tools lying around our office – of which there are many to keep our printers well oiled and printing – and designed a hedgehog storage device . Perfect for organising tools, memory cards and is completely unique. We’re calling the hedgehog Jeff. Slowly coming together and sneaking a peek, the Jeff was printing just fine. It’s wasn’t too long before Jeff was finished and we were able to prove that Jeff’s storage principle worked. Another fun maker project ready to keep our desks tidy and well organised. This one’s a real keeper and for us messy tinkerers it’s very welcome.